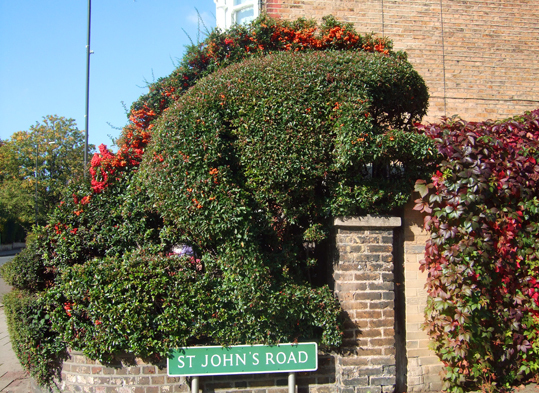 Someone who lives quite near me in south London has artfully pruned their bush into this wonderful reptile. I'm not sure if it is meant to be a dinosaur - the house isn't far from Crystal Palace Park, which is famous for its dinosaur statues - or some other kind of lizard. It is impressive though. I particularly like the way that the autumn berries make it look as though it has red frills running along its back. I guess the British aren't as big a fans as Americans are. That's why I recognize this guy immediately. It's Godzilla!!!! Oh yes, it does look a bit like Godzilla, doesn't it? I naturally thought dinosaur because it is just down the road from the Crystal Palace dinosaurs - big statues of dinosaurs built in Victorian times in a park.